Successfully Added Pocket Mini Karaoke Singing Microphone (3.5mm) to your Shopping Cart. Practice and improve your KTV singing skills anywhere at any time with this professional Pocket Mini Karaoke Singing Microphone. 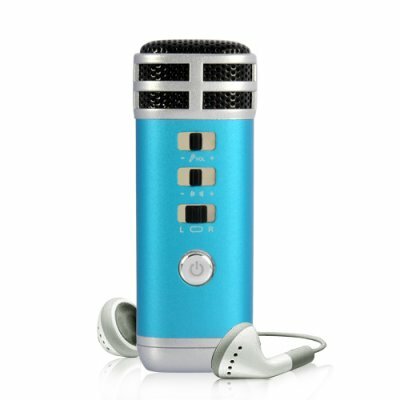 This portable KTV microphone is convenient enough to take anywhere for a way to instantly practice singing. Put in your pocket or leave it in your bag and when you have time, take it out, plug it into your mobile phone, MP3 player, or computer and start singing away! The microphone connects to any 2-channel 3.5mm earphone jack (which is present in almost all modern electronics) and will let you listen to your own voice being projected, making it sound just like it would in an actual karaoke bar. This Pocket Mini Karaoke Singing Microphone is simple and easy to operate, without the need to install software or do any type of setting up. Once connected, the built-in battery can last for many hours, so you're free to practice the night away. Really want to impress someone with your singing at the next group date? Don't want to look forever alone singing by yourself at a KTV? Then this Pocket Mini Karaoke Singing Microphone is the solution. Available in-stock in our warehouse, this unique gadget is ready for immediate orders. Better yet, order now and we'll have it shipped out tomorrow - guaranteed! Brought to you by Chinavasion, the leader in wholesale electronics and cool gadgets.